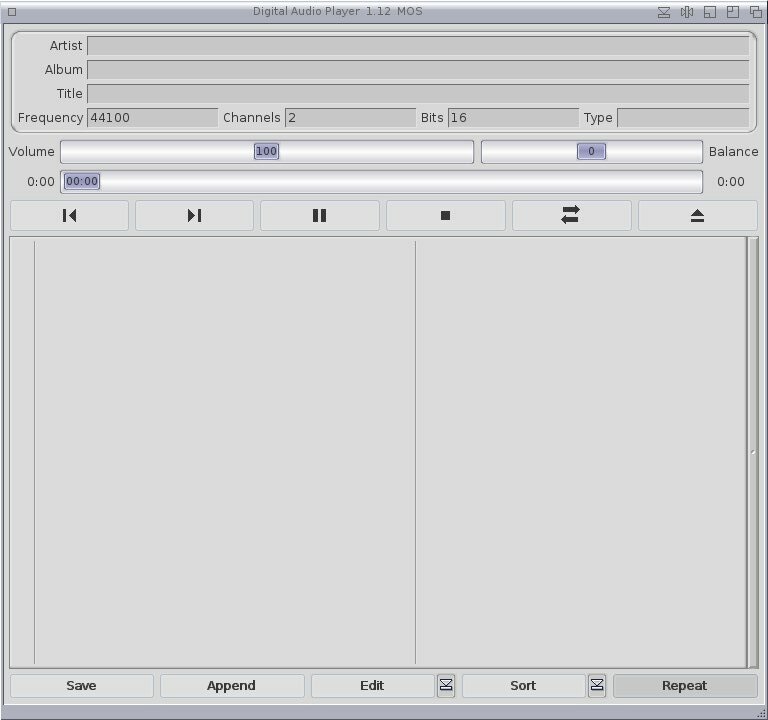 DAPlayer (Digital Audio Player) is a MUI based music player by Thomas Rapp who released version 1.12 a while ago. Unlike Jukebox (but like Aminet Radio) it can play Audio CD and a variety of Amiga music files, like MOD:s. As we shall see, this player still needs some work done before being able to compete with other players. Volume change volume, even adding sound virtually if your speakers are too weak (up to 400). Balance changes the ratio of left-right speakers. Moving to the left will give more sound to the left speaker etc. This is sometimes a good feature when you listen to 4-channel MOD:s. 0:00 is of course the list of the position of the music piece. The part to the left will tell you how many minutes and seconds your song have played and the right one will tell you how long the song is. You can change where in the song you want to go with the bar in the middle. The buttons below means, from left to right; previous song, next song, pause, stop, randomize and choose songs. Pretty standard. Save at the bottom saves a playlist. The problem is that the manual isn’t that good and it doesn’t tell you what the playlist must be called in order to show up when you chose files. Typing the name directly in the file requester loads it though. Append adds a song or several songs. 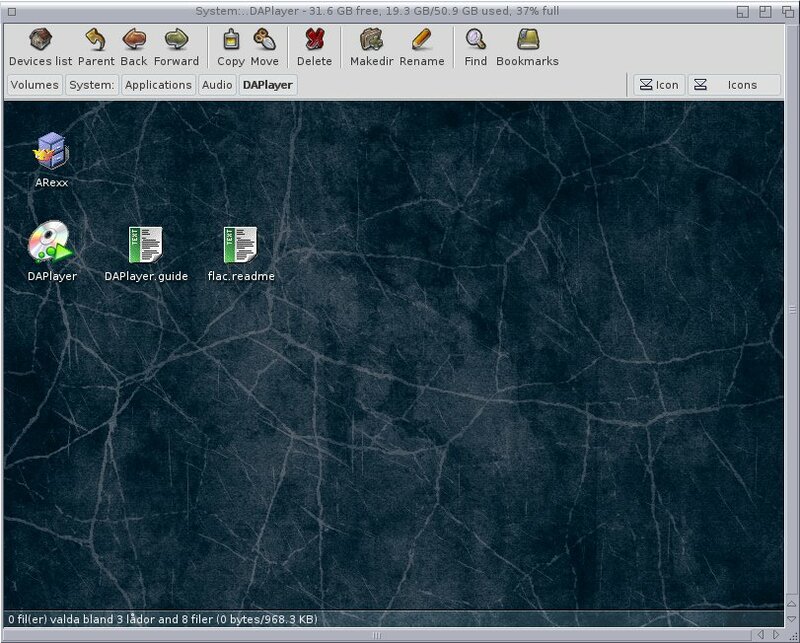 Edit lets you choose files in the list. 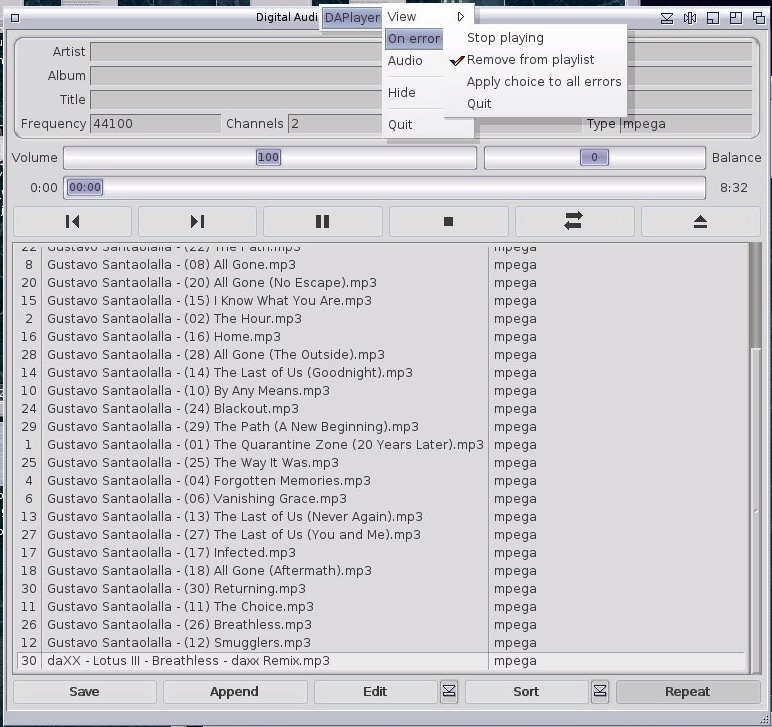 Click on it, choose Select, select songs from the list and then click on Edit again and choose Remove. You can’t just choose the files and press delete, which is quite annoying. If you press on the choose songs button all files from the list will be removed. Sort lets you sort the songs according to name, artists, folder etc. Repeat repeat the song or songs on the list (if it’s grayed out it means that it’s on). As you notice there is no information at the top, where name and artist etc should be shown. Yep, the player can’t read ID3-tags apparently. Though it does show the cover art as shown above. The songs play as they should, even though this program is a little prone to crash and break. 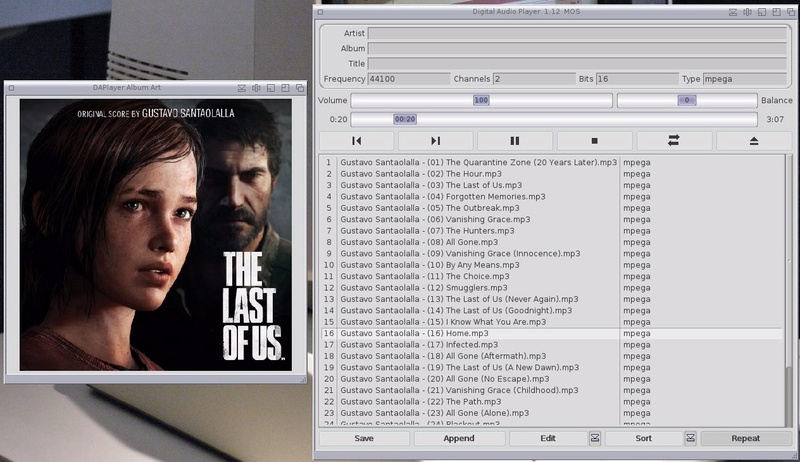 Some MP3 songs doesn’t work, as well as some MOD:s (it is written in the manual that some music files needs some tweeking. Files that Aminet Radio can play doesn’t play on DAPlayer nevertheless). Audio CD also doesn’t work. It always complain that there is a CD error, even though Jukebox can play them without problems. But sadly, this feature is not as great as it seems since it doesn’t remove non working music files but instead asks the user what it should do nevertheless. It gives you a box with your default setting pre-checked. If you still have to remove the files manually. It turns out, you also need to click also on the Apply choice to all errors below for it to work automatically. Not all that obvious maybe, but once checked it does work as expected. Non working files are shown until they are being played, then it promply disappears and next song is played. A very nice feature indeed! Sadly, this program needs some more love in order to be a competitor to my favourite music player, Jukebox (included with MorphOS). But unlike Jukebox this can play various amiga music files (when it works). So I still think this program has potential and I’m looking forward to future updates. This entry was posted in Uncategorized and tagged Media player. Bookmark the permalink. The data: assign for DAPlayer is in the file timidity.cfg, in the directory of DAPlayer.